On the island of Maui, a sixteen-year-old international spy named Rio Kayenta discovers a two-thousand-year-old coral stone. Legend has it that the stone is meant for a girl named Amber and that with it, she can stop the evil S.H.R.O.U.D. organization. Amber Page lives in the Arizona desert and wants one thing more than anything else in the world: to see her mom and dad back together again. Amber's mom is a school bus driver who has split with her dad, but Amber believes the two still love one another. When a strange old man stops at nothing to tell Amber that the legendary stone is meant for her, it frightens her and her family deeply. It is a race against the clock to get the stone to Amber and to see if she will realize its legendary powers. For with the stone strengthening her, Amber may be able to save her family and the world. David Morrell, internationally bestselling author of First Blood and creator of Rambo - "This is one heck of a good idea for a novel." Simon Wood, author of Accidents Waiting to Happen - "A Da Vinci Code for the junior high generation." Jeremy Robinson, bestselling author of The Didymus Contingency - "An entertaining, fast-paced read with a hero like no other… Highly recommended." Mark Jeffrey, bestselling author of The Pocket and the Pendant - "[Stacey Cochran] has very clear empathy for Amber, her mom, her dad and their situation in life." Ken Brosky, Editor-in-Chief Brew City Magazine - "Nonstop action… powerful!" 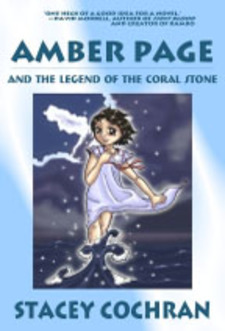 We will send Amber Page and the Legend of the Coral Stone to your Kindle at . Amber Page and the Legend of the Coral Stone has been sent successfully to your Kindle!